Though there had been some snow and ice at the end of November/beginning of December 1978 today, Saturday the 29th was the day that Winter really kicked in. Heavy snow showers on a strong Easterly wind left a few inches of snow lying with a temperature of -2C. My works Christmas/New Year party was on this evening at a country inn and when it finished everyone had to walk home through the snow apart from a few favoured ladies in very inappropriate attire who luckily got a lift in the pub owners landrover. This winter gave me 75 snow lying days there, the most since 1963, and not seen again until 2009/10 when it was well beaten with 95 days snow lying. One memory I have was a journey to London for a job interview on the overnight train on the 14/15th February through the blizzards. My train set off from Pitlochry in the evening but only got a few miles when the diesel froze. A relief train sent from Perth also froze and it took several very cold hours with no heating before a second engine got to us. Through central England we hit blizzards with very fine powdery snow blowing into the train through air vents. I finally arrived at Kings X over 5 hours late and rushed for my interview scheduled for 2pm in Tottenham Court Road. On arrival I found that one of the two people conducting the interview had not made it into work from Hertford due to the weather which I did find a bit ironic. The interview went ahead with the remaining one person and I did actually get the job. The return journey overnight 15/16th was even worse with frozen points causing the train to be over 9 hours late arriving in Perth in the evening instead of first thing that morning and terminating there rather than going on to Inverness. British Rain kindly offered all the passengers who were going to have to wait until the mornings early train from Edinburgh a trolley with cold tea and squashed cold pies almost leading to a riot. A call home from me did result in my brother making a hazardous drive down the A9 to get me back that day. Anyone else have any memories of that Winter? That was certainly some blizzard, Norrance - we even had deep drifts in Milton Keynes...My then brother-in-law and I drove up the unfinished roads and dived headfirst into every snowdrift we could find...Even falling off his motorbike was painless! Being two years old at the time, I was too young to remember this winter, unfortunately. However, I’m lucky enough to remember 1981/82 and indeed those great winters through the mid 80’s. Winter 78/79 is my benchmark winter for snow and cold. Late on 30th the blizzard started and stopped late morning on NYE. 6foot drifts in the fields on the edge of Bristol (in my locality). Biting Easterly winds, powder snow; i think temps got down to minus 8c in early hours of New Years day. Then in 1st half of January we got another couple of classic blizzards. Yes, remember it well, as if it was only yesterday. No memories of 1978/79 - far too young, alas strong memories of the above. We had a run of 7 ice days between 25th and 31st, however, the expectedsnowy breakdown never really materialised here, instead we had a freezing rain event, indeed many places did. The cold ebbed away on New Years Eve, and I remember New Days day being one of rapid thaw and rawness. A very similiar scenario occured New Years Eve 2000, on that day we did see a snowy breakdown, a wet snowfall and then a rapid thaw set in during the early hours of New Years Day. What a far cry this New Year is going to be - no weather to talk about! Not sure why you keep thinking the 90s winters were that great. 1989-90, 1991-92, 1992-93, 1994-95, 1997-98, 1998-99 were not brilliant. Not a patch on the 80's winters. Remember it well especially the end of year blizzard . I can vividly recall following a snow blower for about 3 miles on my Yamaha Rd 250 with the snow piled up on either side of the road. The film version of Porridge was filmed during January 1979. That is on today, BBC 2 at 5.30pm. Some good snowy scenes on view. yep the 1990s should hold its head in shame compared to what went before..apart from Feb 1991..you can sit in the pub car park with a coke and packet of crisps whilst the 60s, 70s and 80s get the beers in. The winter 78/79 still the benchmark here.We lived on a remote farm at 340m all the roads were level with snow to the walltops.It took us 10 days to dig our lane out by hand the 1/3rd mile long but then had to wait another 5 days before the council cleared the main road.We were then given the sub zero January which had a further blizzard no month which filled the roads in again. 40 yrs ago today ireland recorded its coldest temp of the 20th century. -18.8c at Lullymore County Kildare . 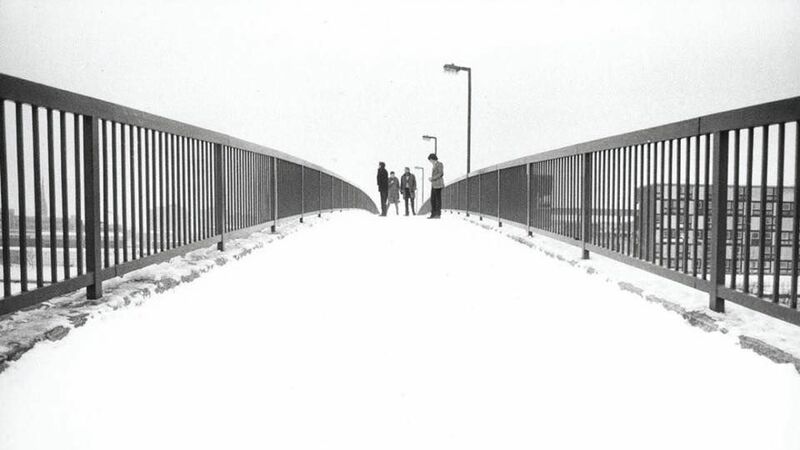 40 years ago today that this icon picture of the band Joy Division on the Epping Walk Bridge, Manchester. Note the snow covered city. Just the start of one of the coldest and snowy spells of the last century. The winters that followed 78/79 were stinkers until 1981/82. I don’t remember 79/79 as I was too young, but I have vague memories of 1981/82, and can remember 1986/87 and the snowy winter of 1990/91. 93/94, 95/96 also produced some snowy weather, but they didn’t match any snow event between 1978-1991. 2008-2013 provided some winters with snowfall that compared to the 80s and 1991. What a fantastic documentary without any narration too and full respect to the uk police force who show off a great authority and marvelous sense of humour under some extreme conditions on that motorway in what was very grim times throughout the UK.Its little gems like this video that makes me very glad that the netweather forums are there.